Kate Biberdorf, associate professor of chemistry at the University of Texas at Austin, shows a fire breathing demonstration during the UTRGV Hispanic Engineering, Science, and Technology (HESTEC) Latina Day on Wednesday at the Health & Physical Education II building in Edinburg. 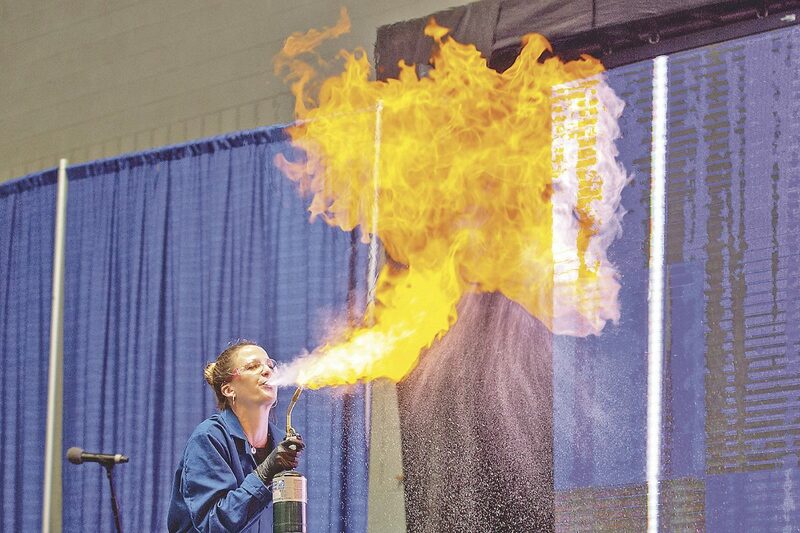 EDINBURG — Kate Biberdorf, associate professor of chemistry at the University of Texas at Austin, told the crowd of nearly 500 female students that while she enjoys performing experiments with dry ice, she preferred the ones with fire. She then proceeded to spit a mouthful of corn starch over a propane torch to create a fireball over the stage at Wednesday’s Latina Day on the University of Texas Rio Grande Valley Edinburg campus. The talk was part of the university’s Hispanic Engineering, Science and Technology, or HESTEC Week. This is the 17th annual celebration of STEM — science, technology, engineering and mathematics — for thousands of students, educators and community members. Kate the Chemist, as she’s better known, led the room in a series of experiments to help students understand the difference between chemical and physical changes. 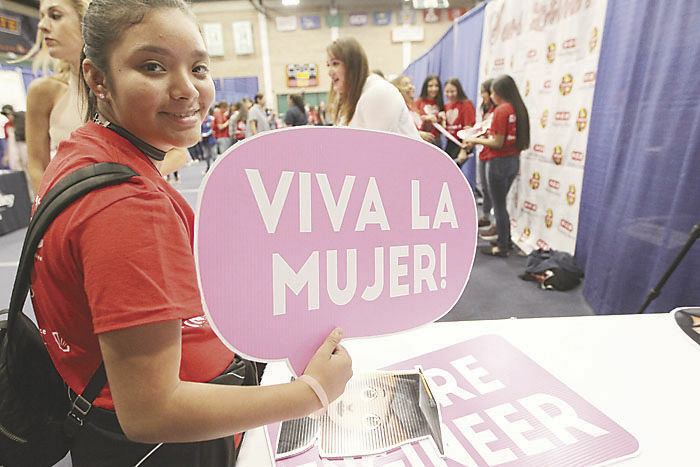 Angelina Charles,13, Brownsville Perkins Middle School during HESTC Latina Day at UTRGV Field house on Wednesday ,Oct. 3, 2018, in Edinburg. She encouraged the GEAR UP students from Edinburg, La Joya and Brownsville to engage in “evidence-based conversations.” Anyone can be a scientist if they’re passionate and ask questions, Biberdorf said. “I’ve had people tell me because the way I look or that I’m a female I can’t be a chemist, and that’s crazy,” Biberdorf said. “That’s absolutely bananas. Her favorite part of the event is interacting with students, she said. She spoke of the 12 volunteers who helped her with the demonstration on stage, mixing and pouring various materials. Earlier, attendees spent the morning at the HESTEC STEM + ME Expo. The event is an opportunity to introduce students to technologies they might not be familiar with and learn about STEM applications with local businesses, academic departments or programs, vendors and military branches. Students stood in line to watch real time, 3D renderings of different dinosaurs on a large screen transposed into the video of passing groups of students. It was part of the “Augmented Reality Experience” exhibit. Other booths had interactive elements like flying drones, programming robots to move with a calculator, playing video games, simulating the effects of substances, or reading the behavior of a doll designed to a replicate a medical emergency. Dr. Adela Valdez, UTRGV School of Medicine associate dean for special programs, stood behind a child-sized medical simulator representing a pediatric patient with asthma triggered by cigarette smoke. Not only could kids learn to listen to lungs, the heart and take a pulse, but she encouraged them to prevent episodes like this by making sure no one smokes around the house. Seeing and touching a moving, breathing doll gives students something tangible to better understand, she said. “Now, it becomes real to them,” she said. “You should see the aha moments when they get to hear or feel something. The interaction might not drive them to a medical profession, she said, but hopefully it’s a component that motivates them to learn more and be curious. For some, the expo was a chance to network with potential employers, educators and like-minded thinkers. A Greenpower USA team, hailing from Vanguard Academy in Alamo, chatted with the participating UTRGV group, in attendance at the expo to show their electric vehicle. Both groups compete in different levels of the car designing, building and racing competition. Natalie Caceres, sixth-grade reading teacher and robotics sponsor at the school, said the teams planned to schedule a training with the college students. For others, it was a chance to reconnect with the event and share their story of success, like UTRGV legacy alum, Samantha Silvas, who graduated from the University of Texas-Pan American with a Bachelor of Science in 2009. “I got hired on from the career fair that’s part of HESTEC,” said Silvas, who has been full time with the Exxon Mobil since an internship she snagged her junior year. Her colleague at her company’s booth used tongs to place aluminum cans into hot and then into ice-cold water, causing it to crush. Silvas said it was demonstrating a vacuum potentially caused by various material or temperatures changes. She folded papers hamburger- and hotdog-style, and placed candy inside to compare how the same amount of material could hold more volume, “to simulate storing oil and gas in the field,” she said. The Edinburg High School graduate has returned to HESTEC for years to represent her company and encourage the pursuit of STEM to young people, especially young women.